Attention: Sherwood writes an inch larger on the Stick than it really is, in the selection you choose the real size that is compatible with other manufacturers. 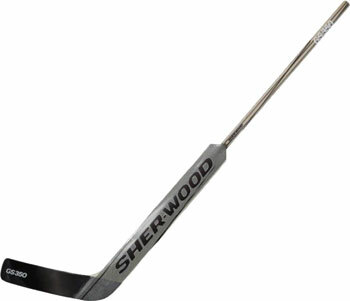 Featuring a traditional aspen core laminated shaft and high-density foam injected blade and paddle, Sherwood has aimed to pour all of its technology into a foam core stick that offers a lightweight, traditional feel, yet remains durable and resilient to repeated puck impacts. Looking to develop better qualities than the SL800 series of stick, Sherwood focused heavily on improving blade durability for the GS350. The result is a new design called CSF Blade technology. Short for Carbon Seal Finish, the CSF blade design features a new high strength carbon fiber plate that is applied to both sides of the blade, creating a sandwich structure type effect in sealing the blade closed. The carbon plate is built with several layers of extremely durable and light high modulus carbon fiber, protecting the interior foam core while keeping the stick feel the same. The new CSF blade results in improved blade bonding, significantly improved durability, and helps prevent premature breakage. Within the paddle and blade, Sherwood engineers have developed a brand new Foamcor tech, a Proprietary foam material used throughout the line of goal sticks. With the Foamcor technology, the GS series of sticks are created using a sophisticated manufacturing process and feature a slightly thicker blade that is stiffer and more impact resistant than ever before.